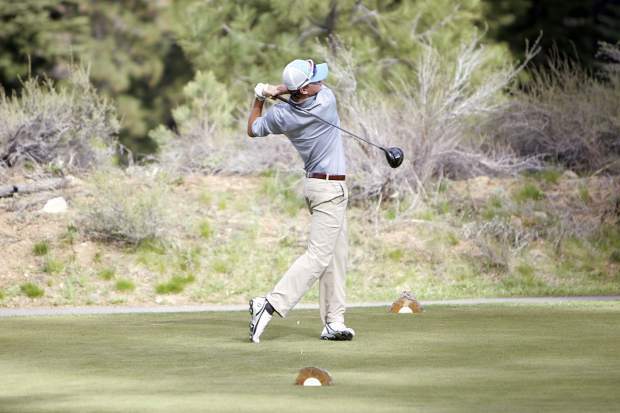 Truckee freshman Ethan Flynn eyes his tee shot at Schaffer’s Mill on Wednesday, May 9. Flynn opened plat at the state tournament by shooting an 83, and sits in seventh place going into Tuesday’s final round of play. The Truckee boys’ golf team competed in the two-day Class 3A Nevada State Tournament on Monday, May 14 at the Mountain Falls Golf Club in Pahrump, Nevada. Freshman Ethan Flynn opened the tournament with a team-best 11-over-par 83 on the 6,608-yard course to sit in a tie for seventh place going into Tuesday’s final round. Flynn began the following day by shooting a 6-over-par 42 on the front nine, and then went 5-over-par on his way back to the clubhouse for an 83 on the day, and a two-day total of 166 for a ninth-place tie. His final round was highlighted by a birdie on the par-4 14th hole. Western’s Jared Smith fired a pair of 71s to take a nine-stroke state championship over Northern League MVP, Spring Creek’s Daniel Mahlke (151). Truckee freshman Jack Brown shot an 87 to opening the tournament and was sitting in 22nd place going into Tuesday’s round. Brown was excellent to start the next day,making the turn with a 5-over-par 41, which included sinking a birdie on the par-3 eighth hole. Unfortunately Brown would struggle over the final nine holes, shooting 10-over-par to finish the day with an 87. With players still on the course Brown is currently sitting in 20th place having shot an 87 both rounds. Sophomore Owen Slusher carded a 91 to open the tournament and came into the final round sitting in 32nd place. Slusher struggled on the front nine to open Tuesday’s round, shooting 7-over-par, but the sophomore caught fire on the back nine with a 3-over-par 39 to enter the clubhouse with an 82. Slusher’s 173 over two rounds has him currently sitting in a tie for 18th place.